Oliver Maner LLP was organized in 1897 when Judge H.D.D. Twiggs and Francis McDonald Oliver formed a partnership known as Twiggs and Oliver. 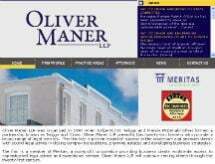 Oliver Maner LLP presently has twenty-two lawyers who provide a broad range of legal services. The firm has a proven record of success in the courtroom and provides clients with sound legal advice in closing complex transactions, planning estates and developing business strategies. The firm is a member of Meritas, a non-profit corporation providing business clients worldwide access to sophisticated legal advice and exceptional service. Oliver Maner LLP will continue serving clients through the twenty-first century.